The Stationary Swim Trainer is a comfortable waist belt that fits up to a 44in/1.1m waist with two 2-ft/60 cm tubes and two 2.5-ft/76 cm of adjustable nylon fasteners with clips on each end. 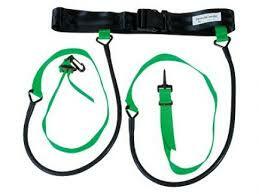 Available in green resistance level (8-24lbs/3.6-10.8kg of pull*). Sold as a single unit. Not interchangeable. The Stationary Swim Trainer is designed for in-place resistance swim training while using lane lines, to train for proper hip rotation and stroke rotation. Allows multiple swimmers to occupy one lane at the same time. Coaches can assist with positioning and stroke while swimmer is stationary. Use in home swimming spas where jets are not too powerful.